Judges at the ‘North West Sci Fest’, held at the Magee campus of the University of Ulster, said the exceptionally high standard of entries augurs well for the future of STEM subjects (Science Technology Engineering and Maths) in local schools. Mr Gerard Hughes, a project manager with Sentinus - an educational charity which works with schools and colleges throughout Northern Ireland to promote engagement with STEM subjects, said the event’s success was further evidence that funding for schools under the Science Specialism Scheme is paying dividends as greater numbers of young people are now studying STEM subjects. Welcoming the pupils and their teachers to the campus, Professor Deirdre Heenan, Provost and Dean of Academic Development at Magee, praised by the high standard of projects on display and said she was particularly impressed by the way the exhibitors engaged so enthusiastically with science to bring their projects to life. The event was co-ordinated locally by teachers Mrs Mildred Gill of Lumen Christi College and Mr Mark Lowe of St Mary’s College, both Science Specialist Schools. The projects highlighted a natural curiously in everyday things such fire extinguishers, safety gloves, worms, spiders, recycling materials, biodiversity and fizzing bath bombs. The overall primary school winner was Holy Child PS for their project on ‘Magnetism’. Best secondary school project award went to St Mary’s College for their project on ‘Testing the Permeability of Laboratory safety Gloves’. “The standard of entries, particularly from the younger pupil bears testimony to the success of the Specialist schools scheme. The specialist schools teaching partnerships with primary schools are giving primary school children a lot more confidence. The standard of entries is improving every year, as is the variety of projects being displayed. Welcoming the pupils and their teachers to the campus, Professor Deirdre Heenan, Provost and Dean of Academic Development at Magee said she was really impressed both by the high standard of projects on display and by the way the exhibitors engaged so enthusiastically with science to bring their projects to life. Thanking Magee Provost Professor Deirdre Heenan for hosting the event and the University’s Office of Innovation for its support, Mrs Gill said the event was ideal for showcasing the work in science being done in local schools. “We are delighted to have been involved in this event, in conjunction with Mark Lowe and his colleagues in St. Mary’s College and would like to congratulate all the students and their teachers on their tremendous efforts in preparing such diverse and enterprising Science projects. The inaugural SciFest was held in the Institute of Technology, Tallaght, Dublin, in 2006. 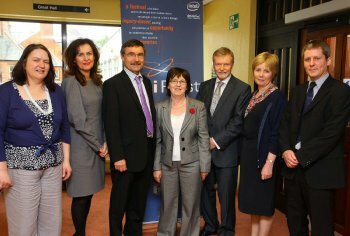 Following a second successful SciFest in Tallaght in 2007 the project was launched nationwide. In late April/early May 2008 a total of nine Institutes of Technology hosted SciFest science fairs. In 2009 the number of venues increased to 15. Since SciFest was launched nationwide in 2008 a total of 6241 students have exhibited 2613 projects. This reflects an increase in participation of 23% in 2009 and a further increase of 34% in 2010.